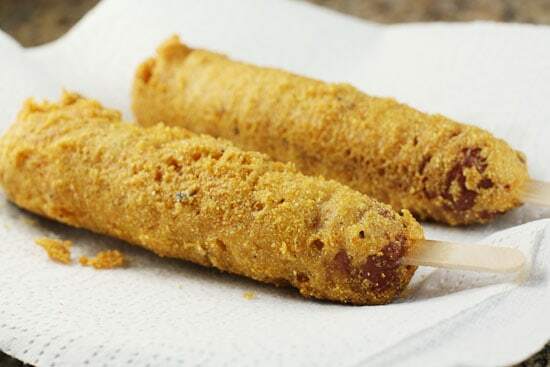 When most people think about corn dogs, they think about county fairs. Or frozen food. Really those are the only two options for corn dogs in most people’s eyes. But corn dogs actually are pretty easy to make on your own. 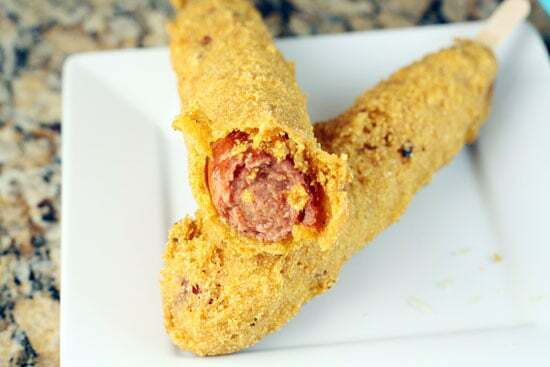 The thing that I normally don’t like about corn dogs is the breading. It’s usually really thick and accounts for like 70% of the corn dog. I wanted to flip that around and start with a nice big quarter pound hot dog and then use a slightly thinner cornmeal batter to make a really crispy crust. It worked like a charm and I ended up with some rustic looking dogs that were crispy and meaty and really hit the spot! Huge quarter pound hot dogs battered in a beer/corn batter and fried. Crunchy and delicious! 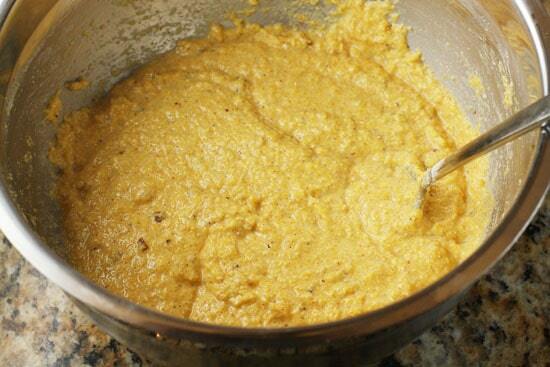 1) Mix dry ingredients for batter in a large bowl. Stir in egg and beer and combine well. 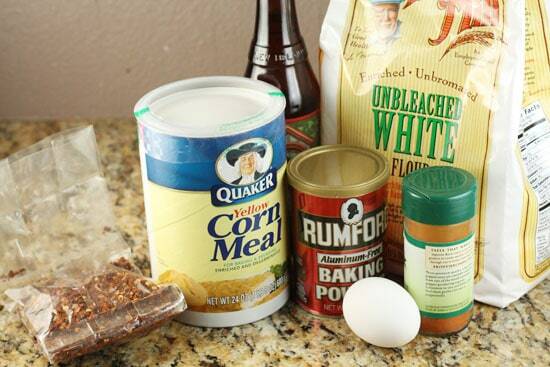 2) Dust corn dogs in flour and knock off any extra flour. A light dusting of flour will help the batter stick. 3) Prepare fry station and heat oil to 350 degrees. 4) Pour batter into a tall glass for easy dipping. 5) Dip dog in and make sure it’s coated evenly. Move it straight to the fryer. 6) Fry for 5-7 minutes until corn dog is golden brown. 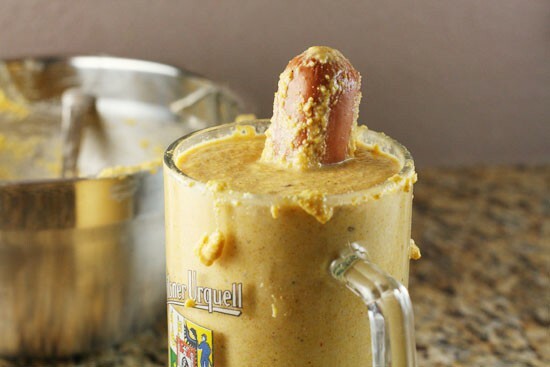 7) Let drain for a few minutes on a towel, insert stick in one end, and serve with mustard, ketchup, and/or ranch. I played around with this batter a bit until I got something that was thick, but not cakey at all. Buttermilk is the standard for corn dogs, but I substituted beer thinking that it would make my crust lighter and crispier. 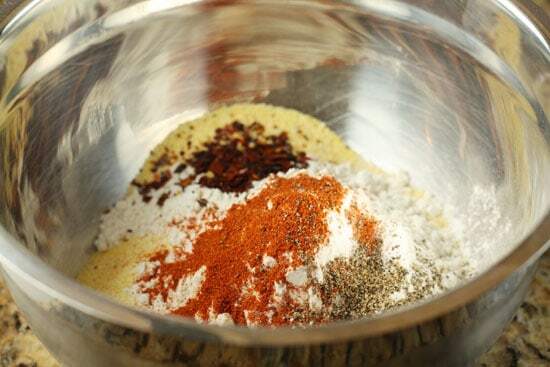 Mix all the dry ingredients in a large bowl. Feel free to adjust the spices to your liking. I tried to make mine pretty spicy. Then stir in your egg and your full bottle of beer. The final batter should be pretty thick, but not clumpy at all if that makes sense. There’s a pretty wide range of consistencies that will work for this. The thicker your batter, the more crust you’ll have on your dog. This was my finished batter. As you probably know, corn dogs are usually served on a stick. 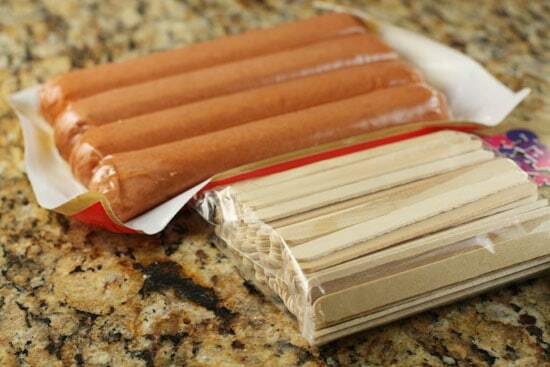 If you’re using thin wussy hot dogs, then you’ll need to use small skewers or something for this. Since my hot dogs were the big guys, I just used Popsicle sticks! Also, when it comes to frying, professional corn dog stands have these little gidgets which hold the dog by the stick while it fries. I’m going to guess that you don’t have one of those and I definitely didn’t. I just fried my dogs without the stick and then inserted it at the end. 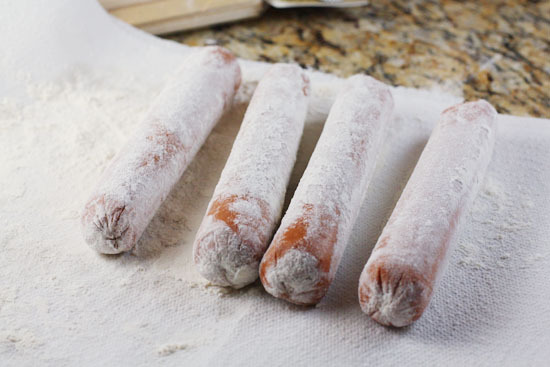 When you’re ready to make the corn dogs, lightly dust the hot dogs in flour to make sure they are really dry. The extra flour will help the batter stick to the hot dogs. Shake off any extra flour and you should be left with a nice even coating. I quickly realized a problem at this point. My bowl wasn’t big enough for my hot dogs! Ideally you can dip your dog in the batter and then drop it straight into the fryer. After some thinking, I realized I could just pour my batter in a big tall glass and then use that to dunk the dogs in. Looks kind of funny but gets the job done! Once you dunk the dogs in the batter, stick them straight in the fryer and fry them at 350 degrees until they are a nice crispy brown, probably about 5-7 minutes. Cornmeal is pretty sturdy so it’s hard to burn these guys. Use tongs to turn them a few times to make sure they are frying evenly. When they come out of the fryer, let them drain on a paper towel and stick in the sticks for easy handling. Put the stick in after the frying! Let them cool for a minute or two and then get to work! This was way more my style when it comes to corn dogs. Really nice, flavorful, crispy crust. In my opinion the only way to eat a corn dog is with really good mustard. Betsy hates mustard though so I served these with ketchup and ranch also. I really loved how these turned out and one dog is pretty much a meal. They are big! If you have leftovers, you can reheat them in a 350 degree oven for a few minutes which keeps the breading nice and crispy. I use skewers and put them in before the frying. Then I can actually submerge them in the oil manually and control the turning and evenness myself. Easier handling, too, when they come out of the oil. This batter looks great, and easy, too! Awesome. Yea… I wasn't sure how the sticks would work in the fryer… thought they might get oily and slippery… Either way is pretty easy though. I love corndogs but have never attempted my own. What a great idea! 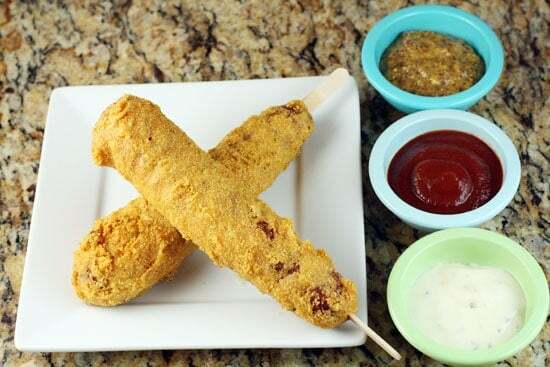 We've been itching to try homemade corndogs so thanks for this post! The only problem with putting sticks in after frying is that you miss out on that gob of extra coating that clings around the base of the dog/stick. Yumm! Well… that's true. That gob is good stuff. Can I make this with masa harina or is that too much like flour? I think that's work just fine. You might need to adjust the batter a bit, but I don't see why it wouldn't work… Good idea! oh my YUM! I will be making these on a “cheater” day…I can’t WAIT! What sort of beer did you use? Does it matter all that much? I can’t remember what I used exactly Anastazia, but any lager would work great. Good luck!